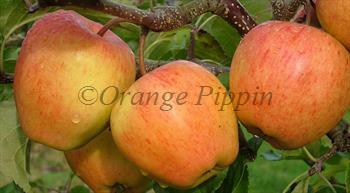 Pinova is an attractive conical yellow apple with a pinkish-orange flush. Cropping is usually heavy, and the apples store well. Pinova was developed in the 1980s in Germany and has some resistance to scab and canker. Although not widely grown in the UK, it is well adapted to the cool cloudy summers which are a feature of the British weather. It was of the few varieties we grow that produced a good crop of clean apples during the dreadful wet summer of 2012. Pinova® is a protected variety. Please fill in the details below and we will let you know when Pinova apple trees are back in stock. Pinova is in flowering group 4. Pinova is self-sterile and needs to be pollinated by another tree of a different variety nearby. Pinova was developed to be resistant to scab, and the blossom has some resistance to late frosts too. It is somewhat susceptible to mildew. Pinova was developed at the Institute for Fruit Research, Dresden-Pillnitz, Germany in the 1980s. It is a cross between Golden Delicious and Cox, crossed with Duchess of Oldenburg. Whilst Cox is not particularly disease-resistant, Golden Delicious is reasonably problem free and Duchess of Oldenburg is an old hardy and reliable Russian apple variety. There is also some evidence that Pinova is a triploid variety, with 3 sets of chromomes instead of the usual 2. This often imparts extra disease-resistance. However Pinova does not have many of the other characteristics of a triploid variety (e.g. vigorous shoots and thick leaves).